Father-in-law Day is the heartwarming occassion to make that old man feel special, who has become your father figure after your marriage and whom you try to keep in good moods day in and out. 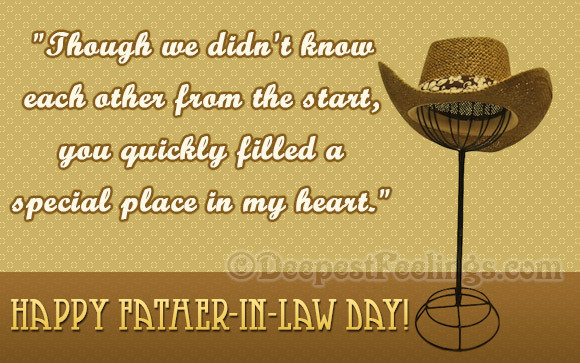 Our beautiful collection of Father-in-law Day e-cards is just appropriate for this purpose and these pretty, thematic pieces are sure to bring a smile on your dad-in-law's face. So send any of these awesome Father-in-law Day e-cards to your papa-in-law for free and make the occassion a lovelier affair for him. 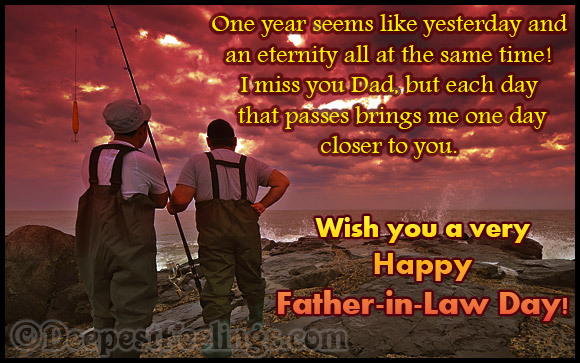 If you like these Father-in-law Day e-cards, click here and refer the entire collection to your friends and loved ones, so that they can make use of these too. Wish you and your pop-in-law a wonderful time ahead! Special gifts to the best Father-in-Law! You are more than Father-in-Law! You quickly filled a special place in my heart.